Your teeth are made up of 96% mineral content, making them the hardest substance in the body—even harder than the bones! However, that doesn’t mean that you won’t ever end up with a chipped, cracked or broken tooth. These are major dental emergencies that can cause you to permanently lose teeth if you don’t get dental attention right away. Find out what each of these emergencies are and what to do about them! Each year, millions of people sustain mouth injuries that result in dental emergencies such as a cracked, knocked-out or broken tooth. At least 5 million cases of knocked out or broken teeth are reported each year, most of which happen during sports. Not enough athletes wear mouth guards for their teeth, which is why sports is one of the highest causes of dental emergencies. Injuries to the mouth can be devastating not only to how a smile looks, but can be devastating to your gum tissue and teeth. A cracked, chipped, knocked-out or broken tooth can quickly result in dental infections or complete tooth loss in the affected area. Dental emergencies include toothaches (especially severe), severely chipped teeth, a chipped filling, broken crown or implant, a cracked tooth, knocked-out tooth or a broken tooth. When it comes to braces, dental emergencies also include broken brackets or wires, pokey wires, a cut lip, cheek or gum and a loose or missing elastic tie. If a dental emergency happens with braces, it can severely cut up a patient’s gum tissue. That is why mouth guards are so important in sports if a patient has traditional metal braces, or lingual or ceramic braces. A chipped tooth is only a dental emergency if the chip is large enough that it has displaced a filling or broken a dental appliance. If you have chipped a tooth or a filling but you feel no pain or tenderness after the chip has happened, it is probably not an emergency. 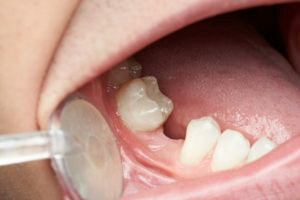 However, when you can’t see the chip (because it was a filling), and there is tenderness, it is because a dental nerve is being exposed or dental decay was underneath the filling. You can fix a chipped tooth even with dental appliances such as brackets on your teeth. How Serious Is a Cracked Tooth? A cracked tooth is different than a chipped tooth, and much more serious even if you can’t see the crack. You can easily crack a tooth by eating the wrong foods depending on how hard your teeth are. Even though your teeth are very hard, the right amount of force can cause a cracked tooth. You can do this much easier if your eating habits (sugary foods and acidic/carbonated drinks) give you weaker tooth enamel. Patients are supposed to avoid hard foods with braces such as nuts, popcorn, hard carrots, apples, chips and similar foods. Poor oral hygiene or tooth decay during braces as well can lead to weaker teeth, meaning they may crack easier. A cracked tooth actually is a serious dental emergency. A crack can continue to grow and can go all the way down to the tooth root. If you have a tiny line but no tenderness, it could just be an enamel crack. If you fracture a piece of your tooth off, it’s called a “fractured cusp”. This usually doesn’t cause much pain. Most cracked teeth fracture a tooth vertically towards the root, which leaves it open for quick infection. A root fracture is even more serious, as you will lose your tooth completely if you don’t get dental help asap. A broken tooth can happen with or without braces on the tooth. If you have braces, you can end up with not only a broken tooth, but a cut gum or cheek if you’ve been hit in the face. The teeth can break off right at the gumline or can fracture a section off. Even if you break half of your tooth, your tooth root can be saved. If you have a dental emergency such as a knocked-out or broken tooth, get dental attention immediately. This is vital if you want to keep your natural tooth. If you have brackets on your teeth at the time of the dental injury, make sure to call us right away. We may have to work with a dentist to remove your dental appliances so your restorative dentistry can be done. Right when a tooth break happens, save the part of the tooth that broke. Place it in a cup with water or milk and make sure to rinse your mouth well with warm water. Apply pressure with gauze or a cloth to the affected area. Couple this with a cold pack outside your mouth on the cheek to keep swelling down. 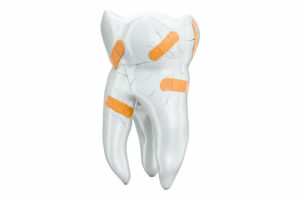 Never handle your broken or knocked-out tooth more than you need to and never hold it by the tooth root. Call the dentist and orthodontist right away. Nobody wants to experience a dental emergency, especially if they have braces on their teeth. These can make dental emergencies so much worse. However, you can avoid a dental emergency with braces altogether. Wear mouth guards with every sport you play, even during practice. Take braces wax with you in a small pack so you can cover pokey wires or brackets. There are also tooth-saver kits that are small and can be carried with you if you ever have a knocked-out or broken tooth. Eating hard foods should be avoided as well. Not only can you end up with a broken tooth or other dental emergency, but you can break a bracket or wire. If you have a dental emergency and wear braces, call Belmar Orthodontics at (303) 225-9016 to get the help you need!